Having a custom-made steel barn home is an excellent way to get a home of your own, without the time and high costs that are associated with the current housing market. 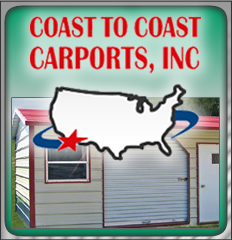 Here at Coast To Coast Carports, Inc., we specialize in making homes that are sturdy, dependable, and energy efficient. Some customers are looking for a large, modern home with a country theme, while others prefer a rustic home that resembles a barn in every aspect. It doesn’t matter what style or size of home that you want, because we specialize in giving our customers exactly what they are looking for. 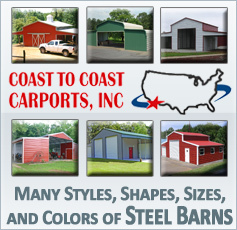 When you decide to get a steel barn home from Coast To Coast, our highly trained team designers will work with you through all the details of creating your dream home. Nothing is too big or small for us, because our main focus is on making our customers happy. Your home will not only look extremely nice, but you can be assured that it will last far longer than homes made from other materials. Steel is the most dependable building material, and it gives a superior level of insulation through all months of the year. Getting a steel barn home is simply the fastest and most affordable way to get a brand new home of your own. Each home is assembled as quick as possible without sacrificing any of the time it takes to make sure your home is of the finest quality. We will make sure that it meets all of your specifications before it arrives at your property, but if at any later time you decide there is something you would like to change, we will be more than happy to help. One of the highlights of our steel barn homes work is seeing the looks of delight on our customer’s faces when they step into their finished home for the first time.